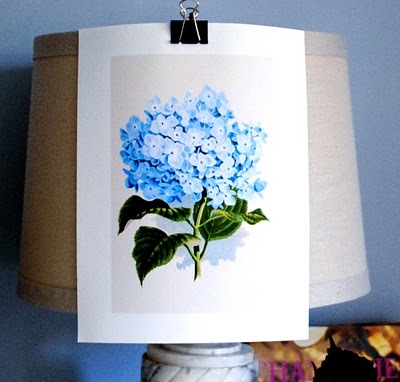 As promised here is the Blue version of the Hydrangea botanical print! You may recall the Pink version that I posted a few days ago, you can find it HERE. This is another one from the INSTANT ART series and I’ve included a display idea as well, to give you another easy decorator option for displaying art, no crafting skills required! For this DIY project, I simply printed out the PDF file and attached it to a linen lampshade on my bedroom lamp. (I didn’t even trim this image, as I thought the white edge gave it a nice border.) I just used a metal clip to attach it, so that it can easily be removed or changed out. I also picked a few Hydrangeas from my garden to display next to it! 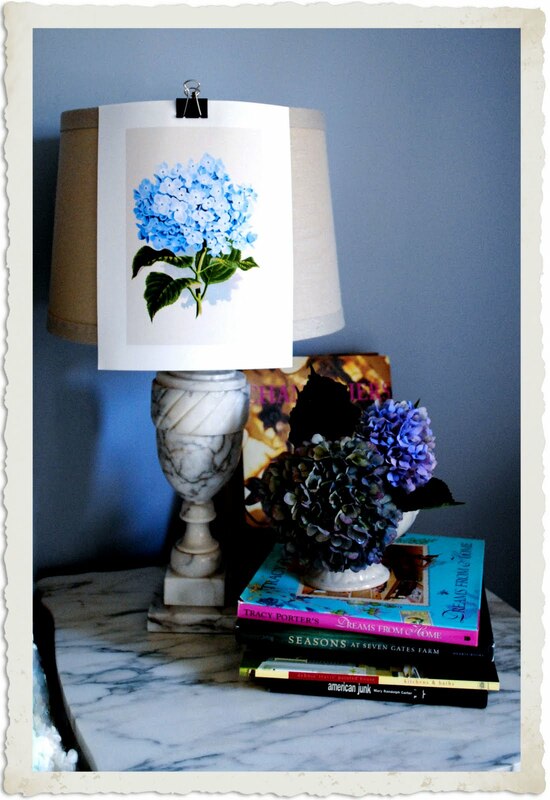 I hope you enjoyed this super simple display idea, if your not partial to Hydrangeas you can always pick out one of the many other downloads from the Instant Art Collection. 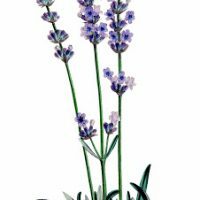 Vintage Stock Image – Lavender Plant – Botanical Antique Red and White Lily Calling Card Image! Gorgeous Vintage Pansy Label Image! simply awesome, the blue is definitely my fave! Oh how I love your blog1 I could look at all the images all day long! This is so beautiful! I’m seeing lots of crafting projects all over Blogland with your images! Thank you so much for giving them to us! Karen, I just want to thank you for the amazing art images you provide to us on a daily basis. Your generosity blows me away. I will pay it forward! Bless you! Beautiful print and use, clever idea just to clip it to the shade. I love both the blue and the pink, thanks so much for sharing. Oh my gosh! I had no idea this blog existed and I have been looking for cute botanicals to frame forever! Is there any way you could do one of the hydrangeas in green? I would love to do a framed set of three with the pink, blue and green in my house! Or even a pretty creme or white hydrangea? I will definitely be sharing your blog on mine soon!! Thanks for doing all these. I’m so excited! Yes, I’ve been thinking about doing a sepia toned creamy version of this print, I could probably do a green one too! I will try to get them posted in the next few weeks, I have lots of other prints I need to share yet, including some more Botanicals. Karen, all I can say is love, love love this one! Reminds me of home! 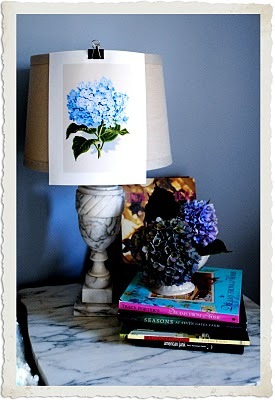 I love hydrangeas, especially the blue ones – thanks for sharing! 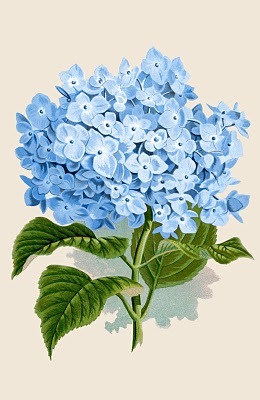 Thank you–blue hydrangeas are my favorite.